Halloween is here and I made this so I could have things such as my pneumatic coffin be activated automatically when someone walked by. First you need to cut the extension cord in half. 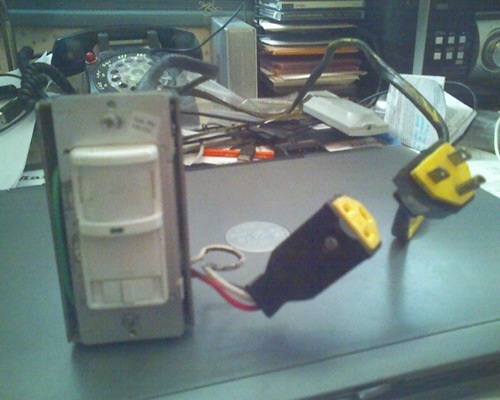 Then using the wiring diagram provided with the motion sensing switch wire the wires inside the extension cord to the switch. Make sure you hook up the ground so there is less of a danger when you are testing it out. Once you have everything wired up you can adjust the duration of activation (mines goes from a few minutes down to 15 seconds). Now all you have to do it plug whatever you want to come on into the switch and when it senses motion it will automatically turn that item on. To get my coffin to work I simply plugged the power supply for my solenoid valve into the switch and when motion is sensed the power supply gets power and turns on the solenoid which activates air to the coffin. Dude this worked awesome! thank for shareing!